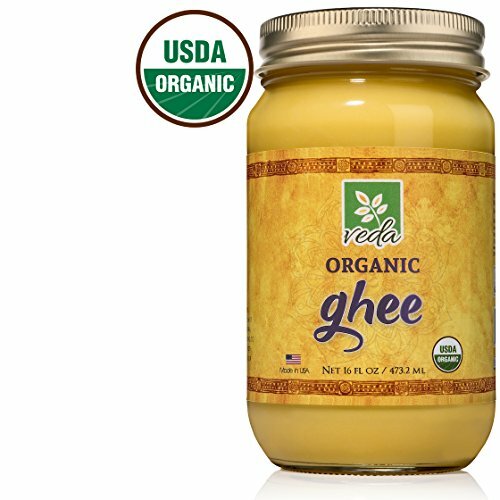 Ghee (the Sanskrit word for clarified butter) is a central component of Ayurveda, an Indian holistic healing system that dates back thousands of years. It is also commonly used in Middle Eastern cuisine. Ghee is created by melting down cultured butter over the course of several days until only butterfat remains. The result is a unique, highly-nutritious oil with a high smoke point and great taste that is ideal for frying or baking (instead of shortening), as a substitute for less-healthy cooking oils, or in bulletproof coffee. We package our ghee in glass jars, so it stays as fresh as possible and is free of any chemicals (like BPA) that may leach from plastic containers. Since the cooking process removes all water content from the ghee, it doesn't need to be refrigerated, even after opening. Ghee can be used as a replacement for butter or any cooking oil (e.g. coconut, olive, canola, etc.). It is often used with popcorn, eggs, and rice. It can also be used to sauté vegetables or prepare a steak. Many nutritionists and fitness professionals recommend ghee as an excellent source of energy, good fat, and vitamins. Beyond eating, ghee can also be used directly on the skin as a massage oil, bath oil, moisturizer, or even to sterilize cuts, burns, and scrapes and help the wounds heal. PASTURE RAISED - Why don't we call it 100% grass-fed? Any dairy cow in the USA that primarily eats grasses must have its diet supplemented to consistently produce milk. Although our Northern California Jersey cows are pastured year-round and overwhelmingly grassfed, their diets must sometimes include small quantities of grain. So, in the interest of complete transparency, we do not claim to use 100% grass fed butter. DELICIOUS TASTE - Adds a gourmet touch to many dishes. This organic ghee, made from organic butter, is a perfect paleo creamer for bulletproof coffee. Just mix it in along with MCT oil. It has a natural, rich, nutty flavor with just hint of sweet. If you have any questions about this product by Veda Organic Ghee, contact us by completing and submitting the form below. If you are looking for a specif part number, please include it with your message.